Principal Myron Kaufman still plays an active role in the business he helped found nearly 50 years ago. Mr. Kaufman has been a builder since 1955. After completing service in the U.S. Army, he began building one- and two-family homes in Queens and Nassau County, and later moved on to larger apartment houses. In 1963, family friend Harold Basser asked Mr. Kaufman to become his partner in a new real-estate development company, and Basser-Kaufman was formed. 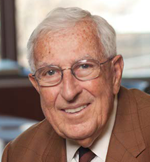 Commercial real estate was the Basser family business and, though Mr. Basser passed away in 1982, Basser-Kaufman remains a family business to this day. Mr. Kaufman’s son Steven joined the firm in 1979 and his son-in-law Marc joined in 1991. They handle day-to-day operations, with Myron Kaufman serving in an advisory capacity. Mr. Kaufman is a longtime member of the International Council of Shopping Centers (ICSC) and served as the NY State Director for several years. He is also a former Vice President of the Long Island Homebuilders Institute. Mr. Kaufman is now semi-retired, and splits his residence between New York and Florida.